Arapaima Gigas is to be found in the great Amazon River system in Peru, Brazil, Columbia and the Araguaia River and its various tributaries in Guyana and has been widely stocked into lakes and ponds in Thailand. This armour plated predator is a member of the ancient Osteoglossidae (bony tongues) order of fishes. The Arapaima is to be found in the northern parts of South America throughout the Amazon basin where it aggressively hunts its prey. With this prehistoric predator inhabiting the largest and wildest river system on earth very little is known about its distribution in the river system. The Arapaima gigas in its natural habitat swims in some of the wildest waters on the planet which endures seasonal flooding in the monsoon season causing the mighty Amazon River and its tributaries to swell and invade the surrounding jungles. With the offset of the dry season the water levels recede rapidly leaving landlocked pools alongside the mighty river. The Labyrinth organ is a complex breathing organ which allows the Arapaima or Pirarucu to inhale atmospheric oxygen which is then absorbed into the Arapaima’s blood stream. This highly evolved anatomical breathing apparatus (labyrinth organ) requires the Arapaima or Pirarucu to surface at regular intervals in which to breathe atmospheric oxygen making these freshwater giants easily visible to anglers. The Arapaima is a highly adept and advanced freshwater predator and is widely recognised as one of the largest freshwater monster fish on the planet. 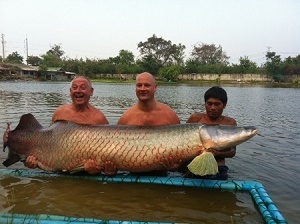 The Arapaima holds the undisputed title of the world’s largest scaled freshwater fish. The Arapaima gigas or Pirarucu has a fearsome prehistoric appearance with a protruding under slung lower jaw and thick armoured plated scaling which covering its entire body. The Arapaima reproduces annually in its natural habitat in the months of February, March and April during low water levels. During this gestation period the Arapaima or Pirarucu creates an underwater nest in which the pregnant female deposits large clutches of eggs into the nest which in turn hatch as the annual flood season returns. The male Arapaima during the early stages of infancy holds the newborn young in its mouth whilst the larger and maternally aggressive female circles the vicinity territorially guarding the new born offspring and its partner. The Arapaima or Pirarucu displays a distinctive vibrant crimson colouration throughout the tail section of its armour plated body further adding to the striking and most impressive appearance of these freshwater giants. This species is the ultimate freshwater predator and actively hunts both live and dead prey fish. The Arapaima feeds both in the upper layers where it aggressively targets live prey fish, reptiles, frogs and on occasion even birds and monkeys whilst also prowling the muddy substrate and opportunistically scavenging on various remains of an assortment of live and dead prey items. The Arapaima has a large hinged mouth which is equipped with a large bony tongue which is used to crush prey items against the roof of its bony mouth. The Arapaima gigas or Pirarucu is the ultimate freshwater predator and is capable of incredible bursts of speed over short distances. The Arapaima is believed to attack unsuspecting prey fish during these high speed attacks with a strike from its bony head before the prey fish is engulfed by its huge cavernous mouth. When a large Arapaima is hooked whilst fishing this spectacular monster fish species displays immense power and speed regularly throwing itself clear from the water and angrily thrashing its head. Recent high profile TV documentaries most notably by Zeb Hogan Monster Fish in Thailand and Jeremy Wade River Monsters have highlighted this most awesome of freshwater giants on a global stage. Arapaima Fishing Thailand is now rapidly becoming a very popular choice for anglers and sport fishing fans visiting Thailand who wish to catch this most hard fighting and spectacular of freshwater giants. This fearsome predator species has been extensively introduced into lakes and breeding ponds in Thailand for over twenty years by fish breeders and aquariums and is now a well established freshwater monster fish species in Thailand. The Arapaima has thrived in the warm exotic waters of Thailand and has grown to record breaking proportions with monster Arapaima reaching lengths of 2.5m’s and weighing an estimated 200 kg’s.